in 1913[A] things went[A7] bad a[D]gain. when[D] Larkin led us[G] on our tireless[[D] way. and[A] sweet young[A7] Ellie by my[D] side. From Stephen's Green we walked to Irishtown. The summer sunshine framed her like a crown. but I had pride and loved young Ellie Brown. For eight long months we starved, but held our ground. Locked out in idle hell, but honour bound. The winter cold went through her well worn gown. As a Larkin man I married Ellie Brown. for men can't stand to watch their children's grief. so we drifted back to work on Murphy's breeze. Then Larkin and his union showed the way. James Connolly came later in the day. In a better land we earned the Larkin way. 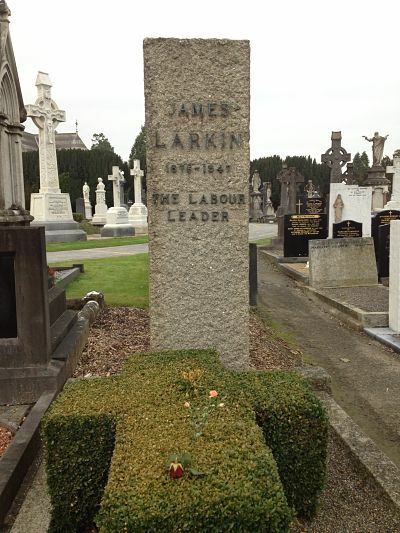 This photo was taken by myself at the graveside of Jim Larkin at Glasnevin in Dublin. In 1913 the tenements were falling down. Jim Larkin led them out, a Union man. Now that Gilmore and Kenny are on the Bankers side. For eight long months they starved but held their ground. But the cold and hunger it broke them, It wore them down. For your answer just ask the residents of Priory Hall. These are the orders that come from Frau Merkel. It’s such a shame ‘cause now we need him so. What the greed of the Banker’s has done to you and me. Chorus: ........................ the Bankers side. Now that Gilmore and co have sold out the Labour Party. This photo is of the fights between the R.I.C. and the strikers in Dublin. The R.I.C. 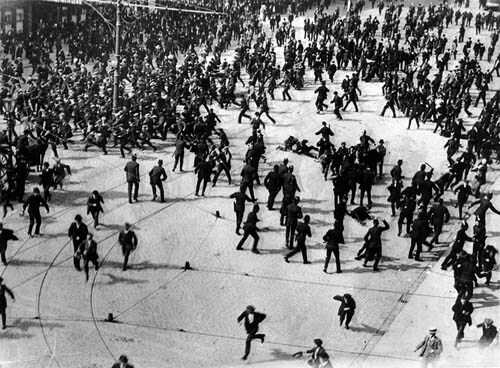 later joined the striking workers.